One of the reasons I am working hard to maintain a capsule wardrobe is because most of the things in it, can take you through all four seasons! I want those great basics in my closet that I reach for again and again throughout the year. Two pieces of clothing that easily come in mind for this are a denim shirt and leggings! And I just updated my capsule wardrobe with both of these items. They are two classic pieces of clothing that every woman should own! Individually worn, these two pieces can provide a multitude of outfit options. Wear a denim chambray shirt with white jeans in the summer; create a denim on denim look with a denim shirt and black jeans for the fall; and layer a denim shirt under a cozy cardigan with slim joggers in the winter. Wear leggings with an oversized tee and a pair of sandals in the summer; tuck leggings inside a pair of boots paired with a cashmere duster in the fall; and wear a pair of leather leggings with a silk blouse and slouchy boot in the winter. In today’s post on the blog, I actually want to take a denim shirt and leggings and show ways to wear them together during the spring season! Because if you too live in a place where spring can be a fickle season (hello, we just got four inches of snow the other day! ), then a denim shirt with leggings can easily become your go-to transitional look! You know I love a layered look! What is so nice about a denim shirt paired with leggings is that a denim shirt can be layered under and over your other basics. And from there you can wear the denim shirt open or closed. I like the idea of a denim shirt over a striped tee, ribbed tank or silk camisole. For spring, a denim shirt looks nice underneath a light knit sweater or underneath your favorite sweatshirt! Top any of these looks off with a blazer, duster, long cardigan or spring jacket. Unless it is a leather legging, I suggest only wearing a flat shoe with a denim shirt and leggings. Sneakers, ballet flats, low slingbacks, and rain boots are all options to consider. Fast forward to summer and I am thinking espadrilles and sandals! Even with a go-to basic look, you want to be able to express your individual style. That is why accessories can often be such an important part of your look! Pair a denim shirt and leggings with a statement necklace, a print or cashmere scarf, or a killer bag. Incorporating a current trend can often add another element of interest to a look built on basics and can often be done subtly and inexpensively! For me, I am all over the layered pearl barrettes right now! 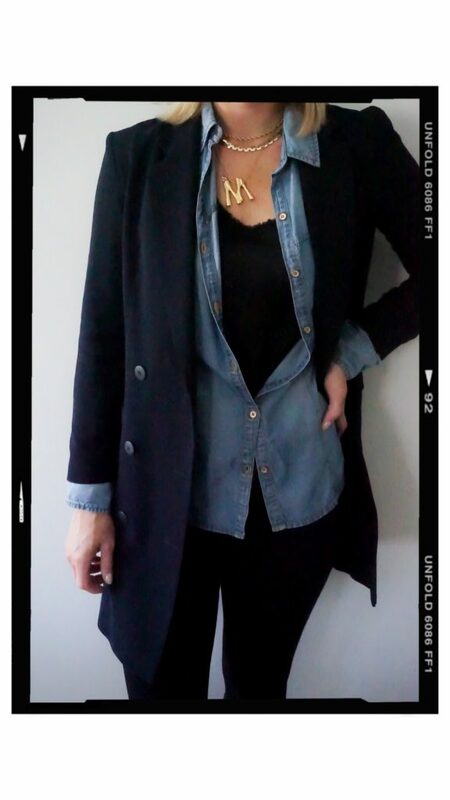 I think a denim shirt with leggings is the perfect transitional and/or four season look! It makes for a great travel outfit, weekend go-to look or as a daily uniform for running around town! Leather leggings with a denim shirt and a pump is a fun look for a night out! I love to wear my Hunter boots as much as I can in the spring and they easily pair with leggings! This time of year I like to add a light sweater over a denim shirt and top it all off with a denim jacket. It is the perfect gloomy spring day look! For running around during the week or weekend, add a striped shirt underneath a denim shirt and layer a long cardigan over it. Finish this look off with your favorite pair of sneakers! To dress up a denim shirt with leggings, start with a camisole as a base layer, add the denim shirt over it and top it off with a structured blazer. Accessorize with gold jewelry, a clutch and a flat shoe. A great look for lunch or a meeting! Nordstrom and J. Crew are my top two choices to shop leggings. I stuck to two criteria in my round-up below: leggings that are not an athletic legging and leggings that come with great customer reviews! I am wearing this legging from Spanx! Obviously they are figure smoothing but they are also seamless, very comfortable and a great shade of black that I doubt will fade! I am obsessed with them! Madewell and J Crew are my top two choices to shop for denim shirts but I also love this one from Topshop! I like dark washes for the colder season and a light washed one for the warmer seasons. When wearing a denim shirt, I like the back to cover part of my bottom, but I don’t think it has to cover all of it!